HUD awarded $20 million for development of a Lifelines pilot in June 2014. The City of New York matched the HUD award with an additional $25 million. A team lead by Level Infrastructure, with Range as a consultant, has advanced the study of the microgrid proposed in Lifelines to the second stage of NYSERDA’s NY Prize competition. 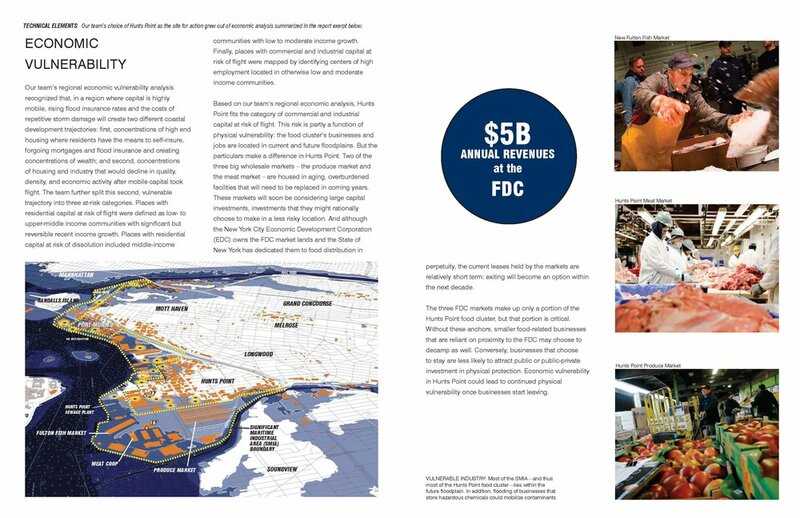 The Rockefeller Foundation selected PennDesign / OLIN as one of 4 Global Resiliency Innovators for our team's work on Hunts Point Lifelines. 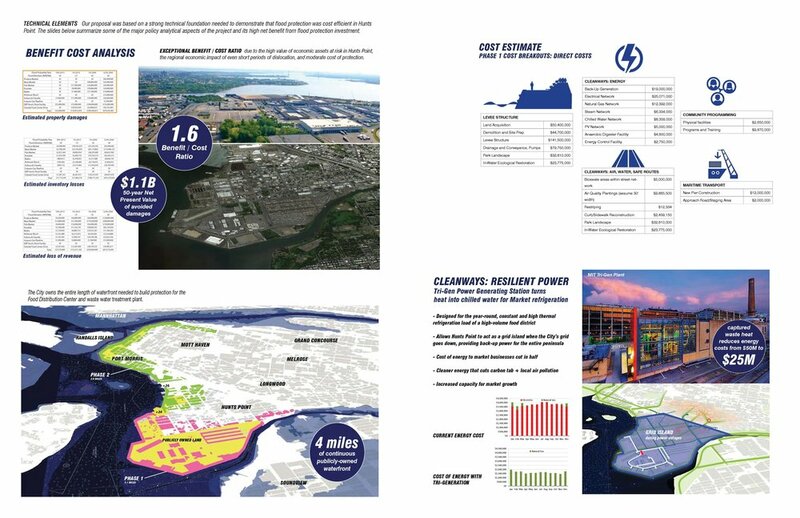 The PennDesign / OLIN team selected the 1-square mile of Hunts Point peninsula as the best place to demonstrate a community-based response to the climate adaptation challenge because it is the intersection of regional importance and vulnerability, local capacity and leadership, and opportunity for change. What’s at risk in Hunts Point is the hub of the food supply for 22 million people, a $5 billion annual economy, over 20,000 direct jobs, and livelihoods of people in the poorest U.S. Congressional District. 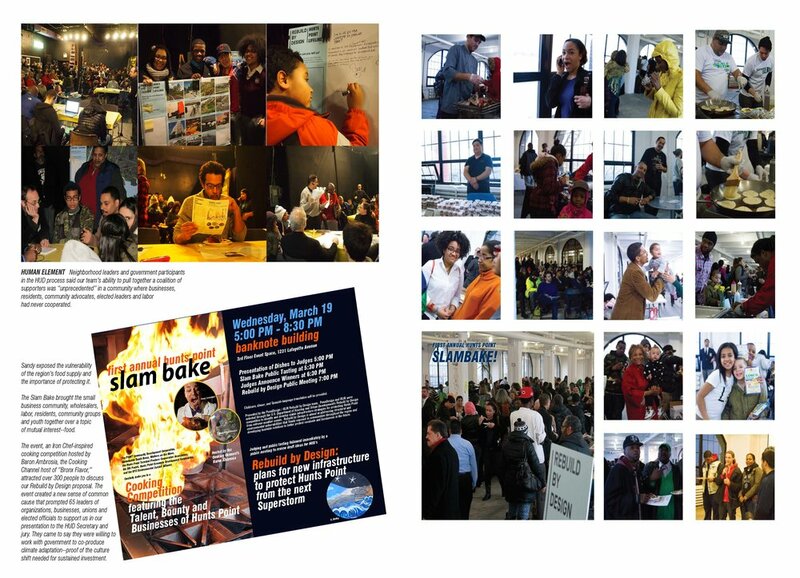 Hunts Point Lifelines builds on assets and opportunities of regional importance, and a coalition of national leaders in community environmental action, business and labor, to create a working model of social, economic and physical resilience. 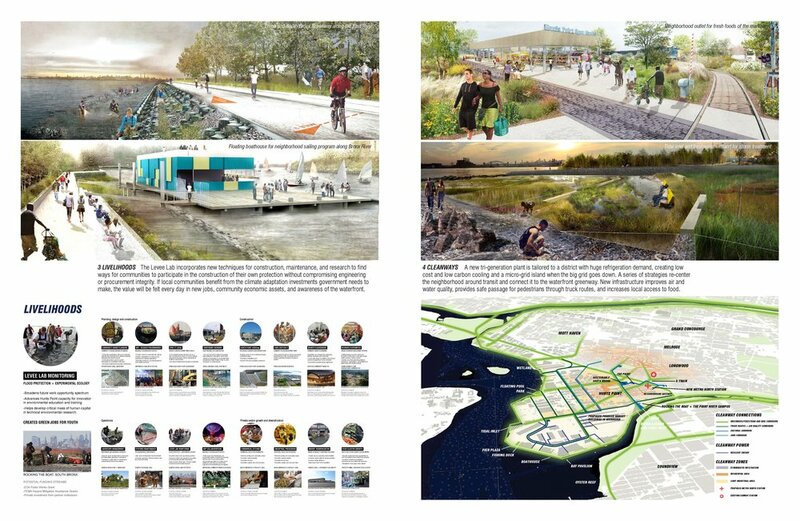 The project demonstrates a formula for WORKING WATERFRONT + WORKING COMMUNITY + WORKING ECOLOGY that applies in maritime industrial areas across the region. Four Lifelines organize the design we developed with a coalition of community organizations, business and union leaders, and elected officials in the Bronx, with the support of many agencies in New York City and New York State. Flood protection that keeps a modernizing food hub dry is integrated with a waterfront greenway that opens up access to the rivers and dynamic windows on the operations and spectacle of the real working waterfront. 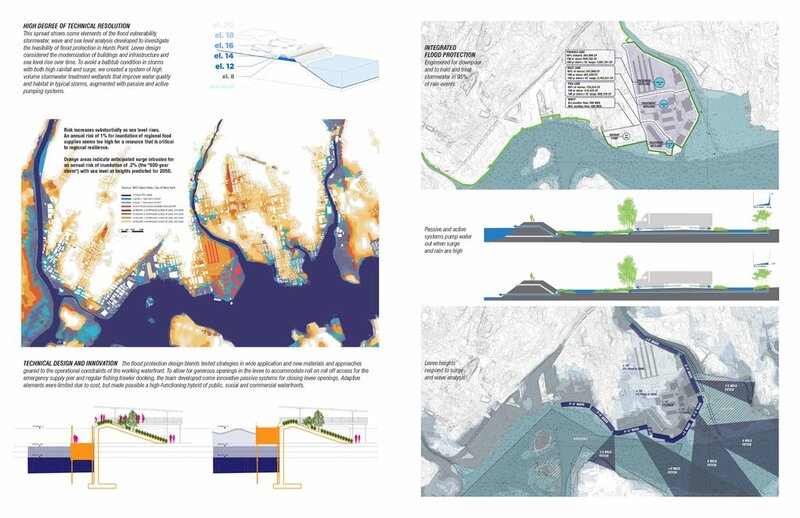 Flood protection incorporates a string of new platforms for recreation and use on the water, and a Levee Lab of designed ecologies and applied material research. Levee Lab pilots contribute to the development of a new regulatory framework for industrial waterfronts. Once the peninsula is dry and powered up, new pier infrastructure on the site of a Marine Transfer Station builds on emerging federal programs to create marine highways and improve preparedness by creating a logistics base for a Maritime Emergency Supply Chain that serves the entire East Coast when roads are impassable. The emergency infrastructure expands intermodal transport by serving commercial fishing delivery to the fish market every day. The Levee Lab incorporates new techniques for construction, maintenance, and research to find ways for communities to participate in the construction of their own protection without compromising engineering or procurement integrity. If local communities benefit from the climate adaptation investments government needs to make, the value will be felt every day in new jobs, community economic assets, and awareness of the waterfront. A new tri-generation plant is tailored to a district with huge refrigeration demand, creating low cost and low carbon cooling and a micro-grid island when the big grid goes down. A series of strategies re-center the neighborhood around transit and connect it to the waterfront greenway. New infrastructure improves air and water quality, provides safe passage for pedestrians through truck routes, and increases local access to food.